Background: More than 100 studies now link racism to worse health. Many people of color experience a wide range of serious health issues at higher rates than do whites, including breast cancer, heart disease, stroke, diabetes, hypertension, respiratory illness and pain-related problems. On average, African Americans, Native Americans, Pacific Islanders and some Asian American groups live shorter lives and have poorer health outcomes than whites. But why? According to the Centers for Disease Control, African American men die on average 5.1 years sooner than white men (69.6 vs. 75.7 years), while African American women die 4.3 years sooner than white women (76.5 vs. 80.8 years). Vietnamese American and Korean American women suffer some of the highest rates of cervical cancer in the nation; Vietnamese American men die from liver cancer at a rate seven times that of non-Hispanic white men. Class certainly plays a role. Because of historical discrimination and structural racism, people of color are likely to be less wealthy, to have less education and to live in segregated communities with underfunded schools, insufficient services, poor transportation and housing, and higher levels of exposure to toxic and environmental hazards. A wide body of evidence has shown that wealth predicts health: the higher you are on the class pyramid, the better your health. Every step down corresponds to slightly worse health, from top to bottom. Inequitable distribution of resources helps explain why. Yet socioeconomic status doesn't account for the whole picture. In many instances, African Americans and other groups fare worse than whites at the same income levels. In fact, infant mortality rates among babies born to college-educated African American women are higher than those of white Americans who haven't finished high school. Recent Latino immigrants, though typically poorer, are healthier than the average American; yet the longer they're here, the more their relative health status declines even as their socioeconomic situation improves. Racism has proven to be a factor affecting health "upstream" and independent of class. Could there be a genetic reason? Researchers funded by the National Institutes of Health, for example, have spent 40 years and several millions of dollars studying Native Americans in southern Arizona, trying to discover a biological reason for their high rates of Type 2 diabetes. Yet their findings remain inconclusive. Hypotheses like the "salt retention gene" explanation for high rates of hypertension among African Americans have also long been debunked scientifically, although they continue to hold currency in the popular press and public imagination. In fact, studies comparing birth outcomes among white and Black American women showed that more low birth-weight babies are born to African Americans, but birth outcomes among white Americans and African-born immigrants to America were comparable. Moreover, the daughters of the African immigrants gave birth to low birth-weight babies at the same rate as African Americans. One risk factor researchers are investigating is how the lived experience of racism can increase chronic stress levels and thus worse health among people of color. According to their thinking, addressing unequal birth outcomes, for example, requires more than just better prenatal care; it also requires that we change the social conditions that produce negative experiences over a lifetime. African Americans have among the worst hypertension rates not because of their genes but because of difficulties they face in their lives. As sociologist Troy Duster explains, the impact of race on disease is not biological in origin but in effect. Anxiety, anger, or frustration from racist experiences trigger the body's stress response, which over time, creates wear and tear on the body's organs and systems. Dr. Camara Jones, a leading expert on racism and health at the Centers for Disease Control, puts it this way: "It's like gunning the engine of a car, without ever letting up. Just wearing it out, wearing it out without rest. And I think that the stresses of everyday racism are doing that." Dr. Jones and others are studying three kinds of racism - institutional, interpersonal and internalized - and how each contributes to health. Whether it takes the form of overt discrimination or structural disadvantage, racism continues to influence how people are treated, what resources and jobs are available, where we are likely to live, how we perceive the world and our place in it, what environmental exposures we face, and what chances we have to reach our full potential. 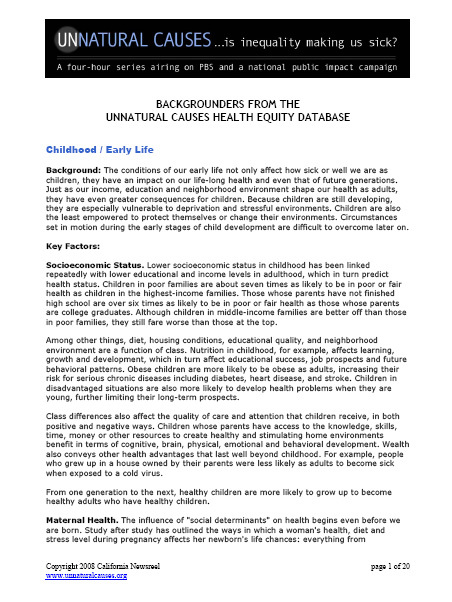 Important policies to address racism and its impact on health include more equitable school funding, better enforcement of anti-discrimination laws, housing mobility programs, better transportation, affirmative action, tax policy and land use, as well as economic revitalization, business investment and wealth accumulation in communities of color. Our national conversation about race tends to take place in black and white— understandably, given the long shadow cast by America’s history of slavery and segregation. Yet the greatest disparities in human well-being to be found in our multiethnic society are not between African Americans and whites, but rather between Asian Americans in one state and Native Americans in another. This new study builds on the methodology introduced in The Measure of America: American Human Development Report 2008-2009 (Columbia University Press, 2008), which uses a composite index to rank the well-being of people by state and congressional district. The 2008-2009 report included HD Index rankings for racial and ethnic groups at the national level.1 The current analysis drills down to assess disparities by race and ethnicity within each state. "Black Americans are failing to climb the social ladder, while a worrying number born into the middle classes are now actually poorer than their parents, according to a study released on Tuesday. The report by Brookings Institution scholar Julia Isaacs found blacks were missing out on a cherished American dream that their children will be economically better off...."
In this original interview, Anthony Iton, director of the Alameda County Department of Public Health, talks about the extraordinary health of recent Latino immigrants and what we can all learn from them, the importance of hope, the power of community organizing, and why it's in all our best interest to tackle inequities sooner rather than later. APIAHF is a national advocacy organization dedicated to promoting policy, program, and research efforts to improve the health and well-being of Asian American, Native Hawaiian, and other Pacific Islander communities. They approach activities with the philosophy of coalition-building and developing capacity within local communities, and advocate on health issues of significance to these communities, conduct community-based technical assistance and training, provide health and U.S. Census data analysis and information dissemination, and convene regional and national conferences on AA,NHOPI health. Memphis, Spring 1968, marked the dramatic climax of the Civil Rights movement. At the River I Stand skillfully reconstructs the two eventful months that transformed a local labor dispute into a national conflagration, and disentangles the complex historical forces that came together with the inevitability of tragedy at the death of Dr. Martin Luther King, Jr. This 58-minute documentary brings into sharp relief issues that have only become more urgent in the intervening years: the connection between economic and civil rights, the debate over violent vs. nonviolent change, and the demand for full inclusion of African Americans in American life. The latest report in United for a Fair Economy's State of the Dream series, "Austerity for Whom?," surveys the impacts of a tax-cutting, government-shrinking economic agenda – as prescribed by Republican leadership with Tea Party allies – on communities of color. We find that if such an agenda advances, the dream of a racially equal society, as described by Dr. Martin Luther King, Jr. over forty years ago, will be pushed even further out of reach. BARHII is a unique undertaking by local health departments in the San Francisco Bay Area to confront health inequities, and recently released a report, Health Inequities in the Bay Area (pdf). The regional collaboration includes public health directors, health officers, senior managers and staff from Alameda, Contra Costa, Marin, San Francisco, San Mateo, Santa Clara and Solano counties, and the City of Berkeley. In addition to its work to help health departments learn from and teach each other, BARHII is developing regional strategies that supplement and support local work. Progress towards meeting the Healthy People 2000 and Healthy People 2010 goals of eliminating health inequities remain bleak. Health gaps between black and white people widened nationally for 6 of 15 measures and in Chicago for 11 of 15 measures between 1990 and 2005, according to a study published in the American Journal of Public Health. Tracking the landmark case U.S. vs Yonkers, which challenged housing and educational discrimination in the North and pushed for desegregation, the film demonstrates how courageous citizens and dedicated lawyers can enforce the constitutional rights of African Americans in the face of dangerous demagogues fomenting racial hatred. The Center for Social Inclusion works to build a fair and just society by dismantling structural racism. We partner with communities of color and other allies to create strategies and build policy reform models to end racial disparity and promote equal opportunity. With our partners we conduct applied research, translate it, teach our communities, inform the public, convene stakeholders, nurture multiracial alliances and support advocacy strategies. The Commission provides an in-depth collection of graphical data ready to download into relevant research and presentations on a range of issues from maternal education and infant mortality to income and life expectancy to placing the U.S. in a global context. Charts can be filtered by social factors or by health conditions. Their State-by-State Data page allows for sorting charts by state and includes an Education and Health Calculator to compare your state to others. The Civil Rights Project aims to help renew the civil rights movement by bridging the worlds of ideas and action, to be a preeminent source of intellectual capital within that movement, and to deepen the understanding of the issues that must be resolved to achieve racial and ethnic equity as society moves through the great transformation of the 21st century. They believe that either the country will learn to deal effectively with the richness of its astonishing diversity, or it will lose pace in a globalizing world and decline and divide. Focused research and the best ideas of scholars and leaders from all parts of the country can make a decisive contribution to a renewal of the promise of the civil rights movement. CivilRights.org is a collaboration of the Leadership Conference on Civil Rights and the Leadership Conference on Civil Rights Education Fund. Its mission: to serve as the site of record for relevant and up-to-the minute civil rights news and information. In the United States, Black infants have significantly worse birth outcomes than White infants. Over the past decades, public health efforts to address these disparities have focused primarily on increasing access to prenatal care, however, this has not led to closing the gap in birth outcomes. This article proposes a 12-point plan to reduce Black-White disparities in birth outcomes using a life-course approach. Currently in its 9th year of publication, ColorLines is the leading national, multi-racial magazine devoted to the creativity and complexity of communities of color. ColorLines features the best writing on the issues that affect these communities, and also celebrates their best expressions in literature, art, music and film, coupling these with incisive criticism. A conversational piece aimed at understanding and intervening on the impacts of racism on the health and well-being of the U.S. population. Some questions addressed: Why discuss racism at all when talking about health? What is racism? What is “race”? Is there something about the environment that we can usefully describe as the "racial climate," and if so, how do we measure it and what is it doing? If we want to confront institutionalized racism, what does that really mean and how do we get started?